OMG! Awards 2013 nominees have been announced by Yahoo! Philippines, as posted on its official website since Tuesday, June 4, 2013. 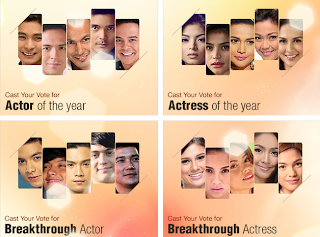 You have until July 12, 2013 to vote for your favorite celebrities and shows. The winners will be announced during the OMG! Awards night scheduled on July 19, 2013 at the SM Mall of Asia Arena (MOA).